A Hawaiian wedding cake will brighten up your big day. There are many fun, colorful options that will make your guests say "Aloha!". Whether you are having a tropical, beach or traditional Hawaiian wedding, your cake is always something your guests look forward to. 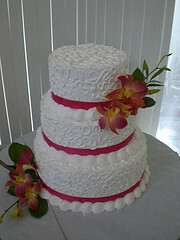 Many people think of a Hawaiian wedding cake as having pineapple, coconut and walnuts. However, there are many more options and flavor combinations available. Other popular flavors include passion fruit, guava and Kona coffee. These flavors can be blended into the cake itself, or some bakeries offer fillings in these flavors. 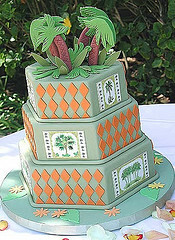 Tropical flowers like orchids, birds of paradise and anthurium make beautiful cake decorations. 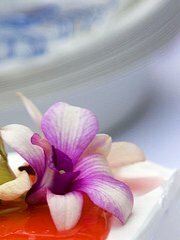 If fresh tropical flowers are difficult to find in your area, consider having sugar flowers made for your cake. Flowers can be used as a topper or as decorations on the cake itself. 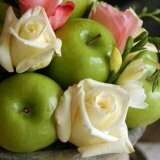 They can also be used to decorate your cake table to tie into the rest of your wedding flowers. A cake topper can be used to finish off your Hawaiian cake. Look for beach or Hawaiian themed toppers to use alone or with your chosen flowers. Hawaiian flowers make stunning cake decorations. Work with your florist and cake designer or baker to have tropical flowers added to your cake and cake table. The right amount and combination of flowers can be all that your cake needs. In the example to the left, a cake topper was not used leaving a simple, elegant design. Hawaiian-themed cakes, like the Tommy Bahama cake at the right, can also be a fun alternative. The possibilities are almost endless when it comes to getting creative with your cake. Fondant and sugar paste can be molded into almost any shape or design. Look for a cake designer that specializes in creating custom cakes to match your theme. Beautiful purple orchids really make a statement on your cake. Try to match up colors from the rest of your wedding to the flower colors you will be using for your cake. Don't be afraid to ask for help. 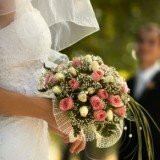 Your florist, cake designer and wedding planner are terrific resources for ideas and help.